Dumfries and Galloway is the forgotten corner of Scotland with everything the highlands have only in a small area, making the whole region very accessible. 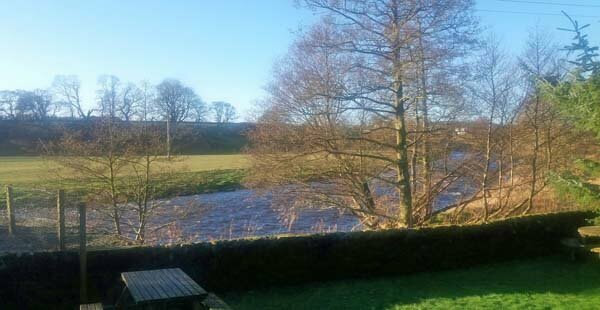 Waterside Cottage is set in an idyllic location on the banks of the River Nith, with a great view of the river and the peaceful surrounding countryside. This beautiful stone cottage has been imaginatively converted from a traditional barn and stables. Waterside Cottage overlooks two salmon pools, one just outside and a second just 200 metres up river where the River Crawick joins the Nith - perfect for fisherfolk! 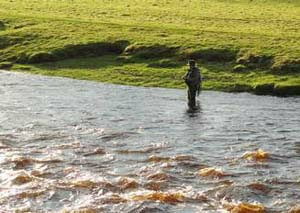 A wealth of other activities are available in this scenic area. 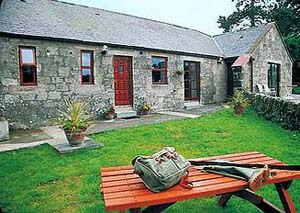 The cottage is situated metres from the Southern Upland Way and provides an ideal base for walking, bird watching, salmon and trout fishing, golfing on the local course or at world famous Troon or Turnberry, as well as canoeing on the River Nith (some of the best white-water in Scotland) or gold panning in the scenic Mennock Valley. The cottage is adjacent to Blackaddie House Hotel where you will find a cosy well-stocked bar with a good array of single malts for you to try. This boutique country house hotel has an award-winning restaurant which is another big attraction for staying at this cottage! Southern Upland Way - on it! 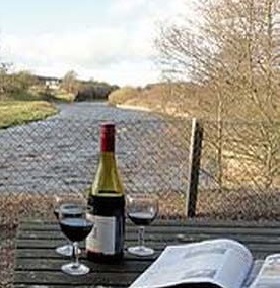 Waterside Cottage is set in an idyllic location on the banks of the River Nith, with a great view of the river and overlooking the peaceful surrounding countryside. Originally a barn and stables, it has been imaginatively converted to provide extremely comfortable self-catering accommodation. 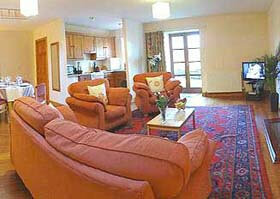 The central feature is an enormous, spacious, comfy sitting room/dining room with well-equipped fitted kitchen. It is furnished to a high standard with large comfortable sofa and easy chairs and a dining table. A large flat screen TV comes with freeview and there are a number of DVDs available if you fancy a lazy day. The kitchen is fully equipped with electric cooker, dishwasher, fridge etc. There is a separate utility room with washer dryer and chest freezer (for that all important catch!). 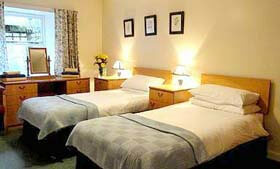 The bedrooms too are large and are set either as a double and a twin, two twins or even two doubles. The beds being zip and link form into a super king size or into comfortable singles. Extra beds and cot are available if required. 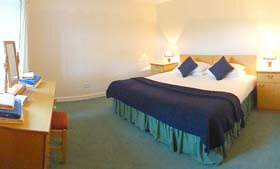 All bed linen and towels are supplied with the beds made up to the configuration you request (eg. twins or doubles). The cottage is fully disabled friendly with a ramp up to the front door (it is possible to get a car almost to the very foot of the ramp), wider doors throughout and the bathroom/WC with shower over the bath is also fitted with the disabled in mind. Located on the A76, Sanquhar stands midway between Dumfries (27 miles) and Ayr (32 miles), and is 1 hour's driving distance from Glasgow and just over 1 hour's driving distance from Edinburgh. Full directions on booking. All linen, towels and heating are included. To see availability for this delightful self-catering country cottage next to an award-winning restaurant, click the enquiry button below and see availability and prices. 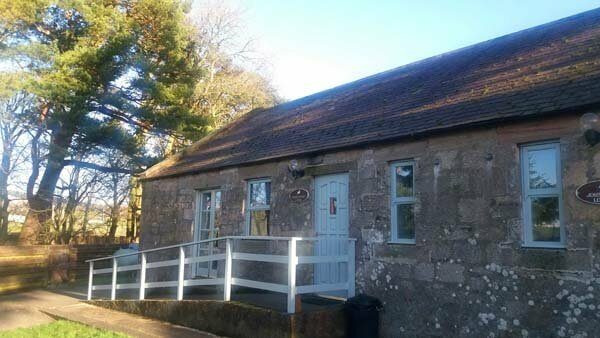 This delightful cottage is right on the side of a great salmon river so is an ideal place to stay if you are looking for a fishing cottage in Scotland. Dumfries-shire is a great place for walking and cycling too and this pet friendly cottage gives you a chance to enjoy the outdoors with your dogs. With a fantastic restaurant next door you don't even have to cook on your self-catering holiday here!